Industry, education and academia join forces in the new sustainable Energy Academy Europe building to work on research and innovation concerning energy transition. This building is internationally noteworthy for multiple reasons. To achieve an extreme sustainable energy level, the building has a special design with a large solar roof. 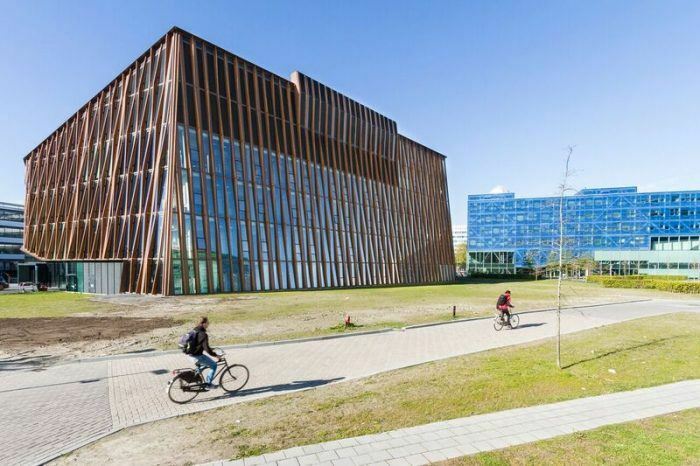 The construction, some 15,000 m2 with BREEAM-rating ‘Outstanding’, was completed in 2016 at Groningen’s Zernike Campus. The way the building is organised is also innovative: academia, education and the business community are brought together in such a way that meeting, exchanging knowledge and collaborating are optimally stimulated. The building was built with the close involvement of the various relevant stakeholders. That the North takes energy transition seriously was proven when the building won both the public and jury prizes on the 2017 Day of Architecture.